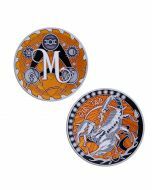 Taurus is the ninth and most bullish of the geocoins in our Zodiac series. The dates for Taurus are April 20th - May 21st. While not as illustrious a story as some of the signs, Taurus or better known The Bull of Heaven dates all the way back beyond the Chalcolithic era and possibly even into the Upper Paleolithic! Leading experts believe he is even represented in the Hall of the Bulls in the ancient caves at Lascaux which date back to about 15,000 BC. He was worshiped throughout the early world by nation after nation after nation beginning as far back as ancient Mesopotamia and later throughout Egypt, Africa and on into Europe with the Druids, Greece and ancient Rome. When it was first observed as a constellation, ancient humans realized that it crossed the plane of the ecliptic and marked the location of the Sun during the Spring Equinox. It heralded the coming of spring to the northern hemisphere. Because of it's significance to humans during the early eras of agriculture, it became a symbol of the renewal of life in spring. The Bull of Heaven called forth the sun and restored life to the fruits of the vine and trees as well as grains of the field. When the spring equinox entered the Bull, the constellation would become covered by the sun in the western skyline and spring would begin. This self-sacrifice of the Bull of Heaven allowed for life to begin again after the death of winter. 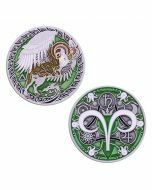 On the face of the coin we see Taurus with the blossoming forward from between his horns to reach out to the land. The 13 stars of the constellation surround the bull of heaven as rays of light rain down to bring forth the fruits of the olive tree and figs (known as the "fruits of the sun" in the ancient world) as well as the grains for harvest. On the reverse side we see the symbol of Taurus with the ancient Greek star breaking through from within and reaching out to the opening leaves in the number of 13 for the stars of the constellation. 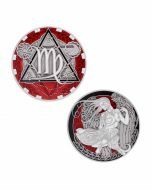 The day ruler Venus lies to the left, the night ruler Moon lies to the right and the participant ruler Mars holds sway above.